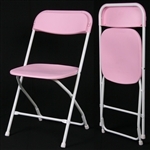 Wholesale Prices for Super Strong Bright Color Folding Chairs. The Finest Plastic Folding Chairs on the market. 800 pd Capacity. We are the only company to provide Weight Testing Data. Our Bright Wholesale Plastic Stacking Chairs are Lightweight and Easy to Store. 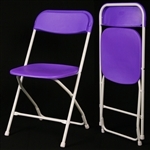 Call Susie for Quantity Folding Chair Discounts 800 914 1969 and Guaranteed Lowest Prices.